Annual review of any chronic disease is an opportunity to make a real difference to patients by improving their quality of life. Often, consultations with patients with epilepsy focus on seizure frequency and fitness to drive. 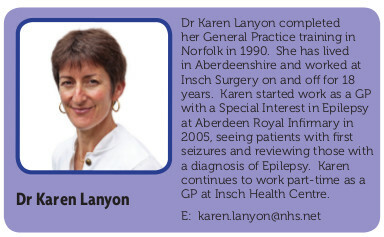 There is much more that can be addressed in Primary Care without requiring a ‘Special Interest in Epilepsy’. A recent study from General Practice found 30% of patients on anti-epileptic drugs (AEDs) were classified as non-adherent with medication based on patients reporting forgetting or skipping doses, or where patients were identified as having low prescription collection rates(2). Some patients choose to miss or stop medication due to side-effects or life-style choice. Others may be non-intentionally non-adherent due to forgetfulness or misunderstanding of treatment. Primary Care practitioners are in an ideal position to identify medication ordering patterns. Infrequent collection rates can highlight the need to discuss patients’ ideas, concerns and expectations about their medication. It is well recognised that patients with epilepsy often experience problems with memory. The underlying epileptic lesion can be a factor in short term memory problems, as can ongoing seizures. Anxiety, stress, low mood and some medications can exacerbate this difficulty. It can be useful to patients to acknowledge the link between short term memory loss and epilepsy. Encouragement to use alarms on mobile phones and dosette boxes can help remind patients to take their medication on a regular basis. Most AEDs can be given twice a day. If patients are on more frequent dosing schedules they may be more likely to forget doses, slow release formulations can help with this problem. Poor compliance with AEDs has been identified as a risk factor for Sudden Unexpected Death in Epilepsy(3). Although this can be a difficult topic to discuss with patients, it is important that all patients with epilepsy are informed of the risks of missing doses of anti-epileptic medication. If patients take their medication on an erratic basis they will be more likely to suffer side effects. Restarting at a lower dose and titrating medication whilst encouraging a regular dosing schedule can help with this. If patients continue to experience symptoms, they should be re-referred to Secondary Care for reassessment of their medication. In recent years, the number of AEDs has increased steadily. Although this may complicate management choices, it also offers new options to individualise treatment more effectively. Patients who continue to have seizures on older AEDs should be offered referral to an epilepsy specialist to consider a trial of these medications. Low mood and anxiety are extremely prevalent in patients with epilepsy. Rates of 21-55% have been quoted. Concern that depression can present atypically in patients with epilepsy has led to development of The Neurological Disorders Depression Inventory for Epilepsy (NDDI-E) which can easily be used in Primary Care and has been validated to detect depression in patients with epilepsy(4). A score of >15 has a 90% specificity and 81% sensitivity for diagnosis of major depression(5). Once patients are identified as suffering from a depressive disorder there is a reluctance to prescribe anti -depressant medication due to the fear of exacerbating seizures. Electronic prescribing cautions use of such medication in patients with epilepsy. Recent evidence has shown the risk of seizures with antidepressants is dose dependent and is reported to be higher with tricyclic antidepressants, with an incidence of only 0.4% to 1–2%6 with newer anti-depressants.. Low mood can affect quality of life as much as seizures and patients with depression are often less likely to be seizure free. An Annual review that focuses on patient’ well-being with particular regard to mood and the patients’ ideas and concerns about their medication can be conducted by members of the primary care team. This can help improve the quality of life for patients with epilepsy. 1. Epilepsy prevalence, incidence and other statistics. The Joint Epilepsy Council of the UK and Ireland. December 2011. 2. Adherence to medicines and self-management of epilepsy: A community-based study. Epilepsy & Behavior Vol 26, Issue 1, January 2013, Pages 109–113 W. Henry Smithson, Debbie Hukins, Janice M. Buelow, Victoria Allgar, Jon Dickson. 4. The Mini International Neuropsychiatric Interview (MINI): the development and validation of a structured diagnostic psychiatric interview for DSM-IV and ICD-10 Journal of Clinical Psychiatry, 59 (Suppl. 20) (1998), pp. 22–23 D.V. Sheehan, Y. Lecrubier, K.H. Sheehan, P. Amorim, J. Janavs, E. Weiller et al. 5. Rapid detection of major depression in epilepsy a multicentre study. Lancet Neurology 2006;5:399-405. Gilliam FG, Barry JJ,Hermann BP, Meador KJ,Vahle V, Kanner AM. 6. Antidepressants and seizures: emphasis on newer agents and clinical implications Int J Clin Pract, December 2005, 59, 12, 1435–1440 Montgomery SA. 7. Predictors of pharmacoresistant epilepsy. Epilepsy Res 2007;75:192–6. Hitiris N, Mohanraj R, Norrie J, Sills GJ, Brodie MJ.